annual revenues. It’s raised about $50 million in venture capital from prominent investors including Virgin founder Richard Branson, Accel Partners, and Union Square Ventures. Hailo also doesn’t try to replace the in-car taxi meter as a means for calculating the fare. That’s something that has brought legal scrutiny to Uber, for example, because smartphones aren’t broadly approved as devices for figuring out how much is owed to a driver. In Hailo’s service, drivers log the meter fee into the app so passengers can pay. Put that all together, and you can get a laissez-faire attitude from the old-school guys. Boston Cab Dispatch and EJT Management, major taxi interests that have sued Uber in local court, don’t consider Hailo a problem. “Although Boston Cab and other local companies have developed their own apps, they can also make use of the Hailo app. In short, Hailo cooperates and works with current drivers and is not a direct competitor,” says Doug Bailey, a spokesman for the companies. Hailo was started about two years ago in London, and added cities like Dublin and Toronto before finally reaching the U.S. with a Boston beachhead last fall. The company was founded partly by actual London cabbies who wanted to create a useful smartphone app to help drivers get around and communicate. “We believe that the best way to optimize the experience for the guy in the back seat is by taking care of the guy in the front seat,” Bregman says. 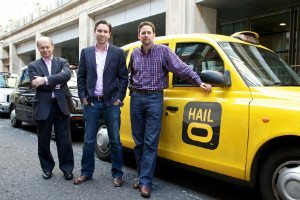 So while Hailo might just look like another electronic taxi-booking service to consumers, it’s actually got another, much more detailed service that operates specifically for cab drivers—a location-based network for keeping in touch with other drivers, a goal- and sales-tracking system, and the ability to take credit cards as payment. “This is a crowdsourced, cabbie-generated feed of events that are relevant to drivers. Everything from traffic … to how many taxis are in the taxi stand at the Four Seasons hotel, to what’s the wait if I go to Logan airport now,” Bregman says. That’s not to say there’s been zero conflict for Hailo. In New York, the promised land for any would-be taxi upstart, black-car services have sued to stop the city’s approved pilot program that would let Uber, Hailo, and others like them start operating their taxi-summoning services legally. The problem, the lawsuit says, is that laws for hiring cars have always carved out rides arranged ahead of time for the black-car and limo guys, leaving spur-of-the-moment pickups for taxis only—another one of those byzantine old regulations that has stayed put for decades, suddenly running into 21st century technology and entrepreneurship. All of this change is going to take some time to play out, and it’s a messy process for everyone involved. But it’s clearly inevitable that smartphone-based technologies will transform the way rides are hired.